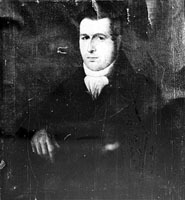 John Lewes Pedder (1793–1859), first Chief Justice of Tasmania's Supreme Court (1824–1854). His main duty initially was trying criminals, when 400 offences were still punishable by death. He gave prisoners the benefit of every possible doubt, and persuaded lieutenant-governors to commute many sentences the law obliged him to impose. He was equally painstaking in civil cases. His obligations as an executive councillor until 1836, and legislative councillor until 1851, generated stresses no modern judge has to contend with and induced poor health. He was knighted in 1838. Further reading: ADB 2; P Howell, 'The Van Diemen's Land judge storm', UT Law Review 2, 1966; J Bennett, Sir John Pedder, Sydney, 2003.